C). To ensure that the plug in line with international standards, do not meet national standards. Skin-friendly leatherette ear cushions designed by ergonomic, adjustable headband fit for all head shapes, all of which ensures you a superior comfortable gaming experience. The omni-directional microphone with free and flexible rotation picks up your voice clearly without aligning the sound source. 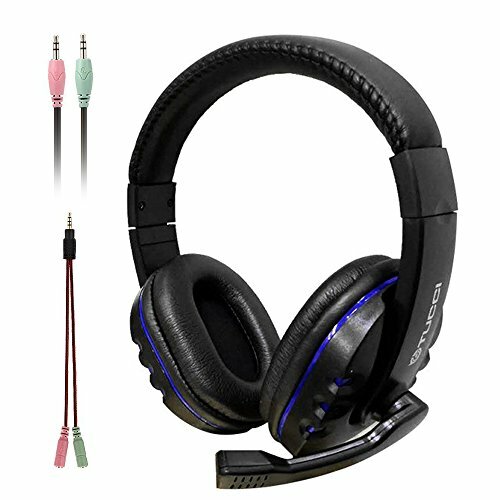 This headset support PS4, Xbox one S/X controller, Nintendo 3DS, Nintendo Switch, PC, Laptop, iMac, iPad, Mobile Phone and any other 3.5mm devices. You will enjoy your game to the fullest. Maximum output power: 20mW 7. Design: full-hooded earmuffs, retractable leather thickened comfortable head beam, high-elastic non-woven fabric, built-in 50MM speaker, 170 degrees rotatable microphone, noise reduction technology, eye-catching LED light designed on headphones and microphones The atmosphere of the game. Equipment: Easy to use 3.5mm international standards (CTIA) device interface (right channel + / ground / left channel + / microphone +), for LED light power supply interface. Compatibility: X6 gaming headset can match a variety of devices, Ps4, Pc, mobile phone, XBOX ONE and so on. You can be listening to music, watch TV, answer the phone, play games and so on. Stereo: High core design brings clear and excellent sound when playing games. The surrounding stereo design is first class, you can feel in the game environment once used, perfect for a large number of games, such as World of Warcraft (WOW), LOL, Call of Duty, GTA series, assassin creed and so on. Material: rugged material structure and high tensile strength can withstand a variety of extrusion, collision or drop, no distortion after twisting; 2.2m military durable braided long-term use. If you have any questions about this product by MMHDZ, contact us by completing and submitting the form below. If you are looking for a specif part number, please include it with your message.